MOLINE, IL - E.J. Hilliard tossed two touchdown passes and ran for another two as the Quad City Steamwheelers made an impression in their first Indoor Football League game. 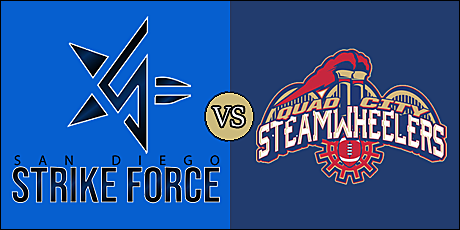 The Steamwheelers put away the San Diego Strike Force in the second half in tonight's IFL opener, 67-49 to move to 1-0 on the season. The Strike Force fell to 0-1. Quad City struck first, capping a five-play, 38-yard drive with a one-yard run from Hilliard. The Strike Force struck back with their own quarterback, Derrick Bernard, on an eight-yard scamper. Darius Hicks' two-yard run gave Quad City a 14-7 lead with 4:31 remaining in the opening quarter. Bernard hit Marques Rodgers on a 23-yard strike to knot the game at 14 apiece with 1:20 left in the first, which provided the end quarter tally. The scoring only intensified in the second quarter as Quad City went up 21-14 on a 12-yard run from Hilliard. After intercepting Bernard, the Steamwheelers doubled up the score when Hilliard found Keyvan Rudd from three yards out. Bernard then hit Julian Stafford on a 20-yard pass to pull the Strike Force to within seven at 28-21 with 3:55 left in the half. Isiah Neely's one-yard run extended Quad City's lead to 14 points at the one-minute warning. It added a point to that on a squib kick which San Diego was unable to move out of the end zone. Bernard responded with a 12-yard strike to Stafford. San Diego closed out the scoring in the half on Hilliard's five-yard pass to Neely. The Steamwheelers led 43-28 at the break. Quad City controlled the third quarter, scoring the only touchdown on a three-yard run from Carlos Watkins with 10:32 left in the quarter. The Steamwheelers also intercepted Bernard twice in the quarter. They held a 50-28 lead at the end of three. Jacob Styte's 43-yard field goal lifted the Steamwheelers to a 53-28 advantage on the first play of the fourth quarter. Just over a minute later, Bernard hit George Moreira for 15 yards and a score. Quad City went up 60-35 on a two-yard run by Hicks, but San Diego countered on Bernard's eight-yard pass to Rashad Ridley. Neely's four-yard run put the Steamwheelers up, once again, by 25 points with five minutes left. The Strike Force added a score on a 13-yard pass from Bernard to Rodgers with just under two minutes to go. The kickers were impressive. Of the 16 total touchdowns scored in the game, all 16 point after tries were successful by Stytes of the Steamwheelers and Ernesto Lacayo of the Strike Force, respectively. Quad City held a slight edge in total offense, 270 yards to 241. That included a 111 to two advantage in the rushing game. The Strike Force were penalized 12 times for 85 yards, while the Steamwheelers were flagged nine times for 81 yards. Quad City held a decided advantage in time of possession, 41:50 to 18:10. Hilliard went 10 of 16 for 132 yards with a pair of touchdowns, while rushing nine times for 61 yards and another two scores. Neely finished with nine carries for 20 yards and two touchdowns, as well as a receiving touchdown. Hicks also rushed for two scores, and Quinton Pedroza led the receiving group with three catches for 65 yards. Christian Jacob's seven tackles led the way for the Steamwheelers. Everett Nichols V recorded a pair of interceptions, and Keith Lewis added a pick. Alfred Kewan added a sack late in the fourth quarter. Wiggins had an average of 28.2 yards on kickoff returns. Bernard completed 17 of 25 passes for 245 yards with six touchdowns and a trio of interceptions. Rodgers caught seven balls for 123 yards and two touchdowns, while Stafford had four grabs for 66 yards and two scores. Timothy Moten recorded seven total tackles. Cory Butler-Byrd, who broke up two passes, averaged 21.6 yards on kickoff returns. The Strike force will have their home opener on March 3 at 3:05 p.m. (pacific). against the fellow expansion Tucson Sugar Skulls. The Steamwheelers welcome the defending champion Iowa Barnstormers to Moline on March 3 at 1:05 p.m. (pacific). Very entertaining game. Pretty good showing by Quad City. San Diego played well in the first half. They can build on that.